Today, on a drizzly, cloudy day in Vancouver, I decided to begin my sushi adventures at Alpha Sushi + Bar. 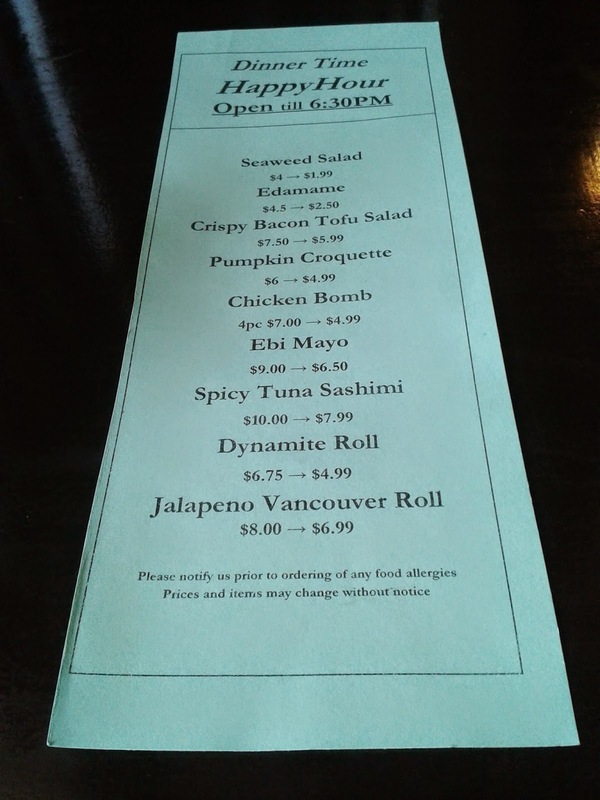 This restaurant, located in the southern part of downtown, is a small, Japanese-run restaurant. The inside of the restaurant had a slightly old-fashioned feel, which was accentuated by the menu I received which consisted of printed pages glued onto a hardcover history book describing the turn of the 20th century. 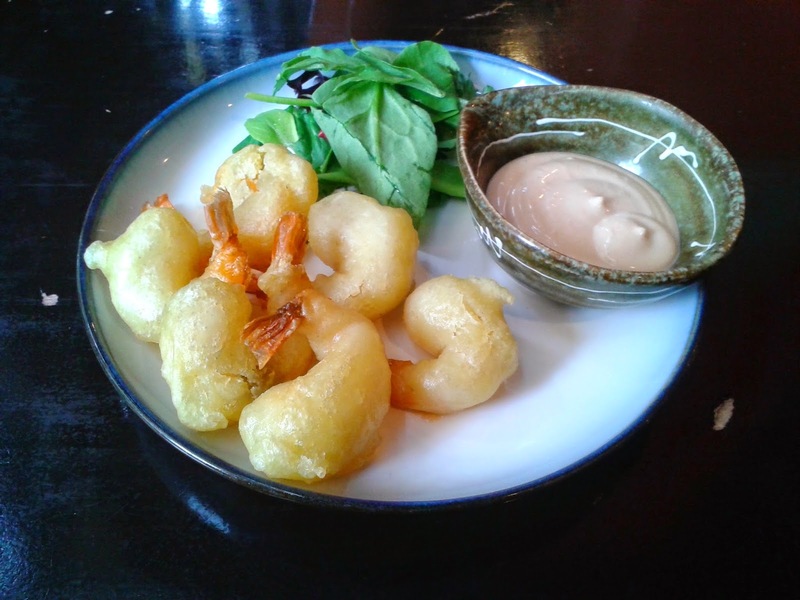 The Ebi Mayo consisted of 6 battered prawns, a mayonnaise dipping sauce and some salad greens. Since the prawns were served very hot, I decided to eat the salad greens first (clever way to keep me entertained!). The mayonnaise had a slight reddish hue and was creamy and slightly sweet. The prawns were not large prawns and were covered with a soft, thin layer of batter. The batter was slightly too crispy in one or two of the prawns, but overall, I was very satisfied with this dish. The Richards Roll consisted of two tempura prawns, tobiko, cucumber, wrapped with unagi, avocado, sweet soy and wasabi mayo. The unagi on top was well-flavoured, but was cut very thin, so the tempura prawns became the main focus of the dish. The seaweed was too stiff and was a challenge to chew. However, the prawns were soft and full of flavour, and the sweet soy complemented the roll well. The roll is not spicy (except for the tobiko but this was barely noticeable) despite the "wasabi mayo". This oven-baked dish contained salmon, scallops and prawns on a bed of butter rice, topped with cheese and cream sauce. The salad that came with it was dressed with a very "vinegar-y" sauce, which was a little too sour for me. The sauce was strong, but unfortunately, it sank to the bottom, so the leaves on the top had little flavour. 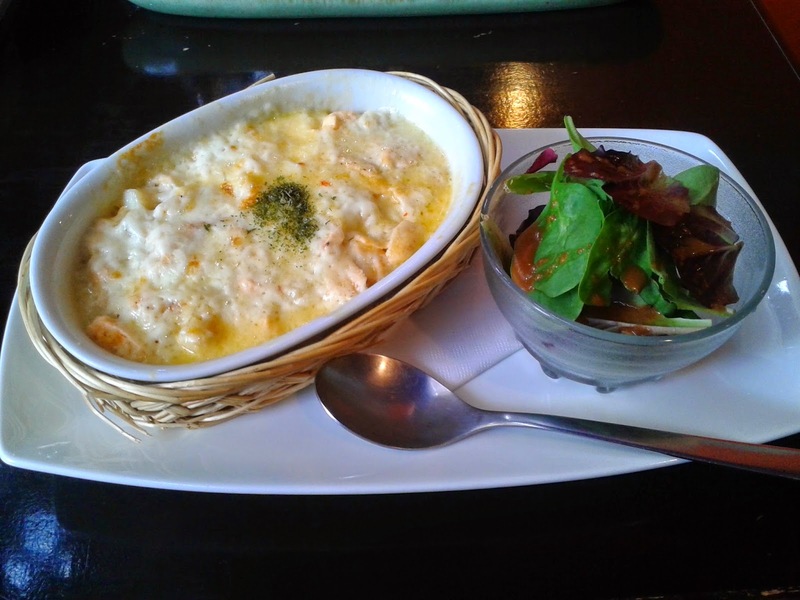 The Seafood Gratin itself had an abundance of salmon and scallop (there were some prawns too). It was mild in terms of flavouring, but the creamy, soft layer of cheese and cream sauce on top made this a delightful dish. The servers had a good attitude and were attentive throughout my visit. Interestingly enough, as soon as Happy Hour ended at 6:30 p.m., several customers walked into the store, just to miss the last call for the special menu. I walked out of the restaurant wanting to take the bus to West End, and saw that the bus was already at the stop. I resisted running across a red light, which resulted in me just missing the bus and having to chase after it. After running all the way to Bute St. (4 blocks away), I had to stop because I developed a massive coughing fit. Note to self: red lights can be evil. Wow, I haven't have sushi in so long. Seeing all those sushi pics got me hungry. On another note: I guess that must be why people tell you not to exercise after you eat. Yeah, don't run after eating, even when trying to catch a bus. On a positive note, at least you didn't throw up all that sushi after chasing the bus. Enjoy reading your sushi posts! I'm glad that I didn't eat until I was full to the max. Thanks for reading!